I am so very excited to share with you all the wonderful gift I received celebrating the Persephone Secret Santa program hosted this year by Claire from the Paperback Reader. There were thirty-three participants from all over the world. Made up of book bloggers, Library Thing members, and Twitter readers, she coordinated it so efficiently - thank you, Claire! This is my first time participating and it will be my very first time reading a Persephone book, so I know I am in for a treat. Thanks go to... the fabulous Nadia at A Bookish Way of Life!! She also just happened to throw in Sense and Sensibility and Monsters . I've never read one of these sorts of books before, so I'm definitely excited for it! And... the big reveal was the Persephone book -- The Making of a Marchioness, by Frances Hodgson Burnett! Persephone Book # 29 was published in 1901 and is 328 pages of the most beautiful paper and ink printed upon it that I've ever had the good luck to lay my eyes upon and my hands to touch! I am quite a lucky gal and I cannot wait to dive into this book. According to Nadia, she wrote in her card that she felt it was a cheerful, happy story -- perfect for the holidays! Oh, did I forget to mention that she also included that little red box full of delectable chocolate from Lindt? Have I failed to share with you that I dream of chocolate, will devour it within an instant upon having it within my grasp? Suffice it to say that I did exercise some self-control this evening and only had one chocolate. Hmm. Well, maybe I had two? Let's just say that the chocolates have found a fabulous new home! Many, many thanks to Nadia at A Bookish Way of Life! How thoughtful and kind for you to throw in those extra goodies and I wish you and yours a fabulous holiday season! Books and chocolate! Your Christmas has definitely come early. Very nice presents. The Persephone Classics have such beautiful cover design! And like Nymeth, this one is high up on my Persephone wish list. Enjoy the new book and the holidays! Well done to your Secret Santa. 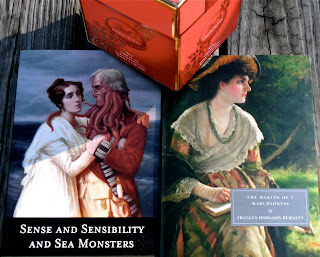 If you haven't seen the Sense and Sensibility and Sea Monsters book trailer you should. It makes me giggle every time. How fantastic! When I was going through the Persephone site for my Secret Santee, I put The Making of a Marchioness on my TBR. I can't wait to read your review! Happy Holidays! what a lovely present to receive. I never got around to joining this year, but I will try and do it next year. It's hard to beat chocolate and a beautiful book! The Persephone books are lovely to touch and look at and I think The Making of a Marchioness was my first one just this year too. Enjoy! So glad you liked it! Enjoy!! Merry Christmas!! Awwwww! You deserve such lavish presents! I know I don't comment here much but I do read and admire your posts. I too, will be reading my first Persephone - feel like freshmen to this to admiration society?! I think we are in for quite a treat. I can't think of a more fun exchange nor a time I've been more excited to read a book. It feels like I'm joining a secret loving club. 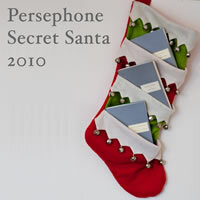 Won't it be fun to read our Persephones over vacation? I'm so happy to read these posts, everyone's excitement, and share in the fun with this lovely gifting. What a wonderful gift! I am hoping that you love the books and am eager to hear all about them because I know you will do them justice! Merry Christmas, Natalie, and enjoy the heck out of those chocolates! I am super naive, Persphone is a publishing company correct? Are they the ones who re-issue lost classics authored by women? Making of a Marchioness was recommended to me by another blogger and I had completely forgotten abou it. Thanks for the reminder. My friend Karen just read that Persephone book! This is one of the only swaps I didn't participate in thsi year, maybe I will next year! Thank you so much for my Persephone books Natalie - I love them! I received The Making of a Marchioness last year through the Persephone Secret Santa and absolutely loved it - hope you do too! so nice!!! love the cover on S cubed! :) i haven't read either but hope you'll enjoy them (and the chocolates!). have a great week. Freaking awesome! Thanks for sharing.